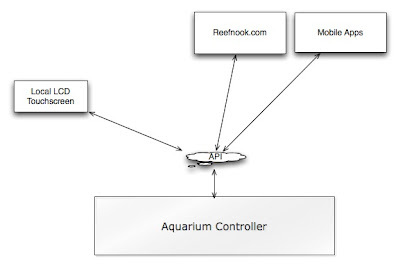 I've been mulling over some ideas for the aquarium controller. Modularity is the key consideration here. 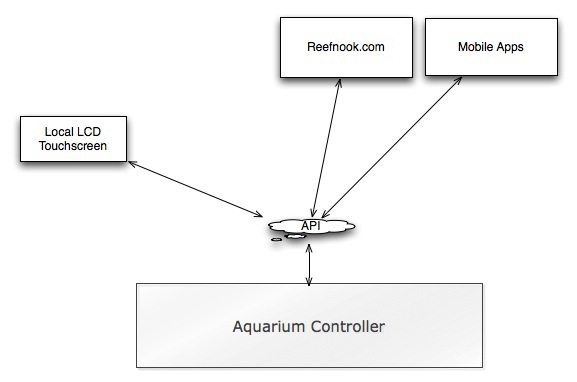 I want the "aquarium controller" to tell time, receive data and push data (chances are, its going to take a temperature reading also, but design will most certainly morph over time) and not much else. The lcd touchscreen display will operate just like the iphone app, android app and reefnook interface, through an api. The main controller shouldn't care what this interface looks like or where it resides as long as it speaks the same language. The benefit this gives the user is that mobile/web interfaces are first class citizens and just as powerful as if you were operating the controller through its own interface. It's 2011 folks, the web isn't going away. I spent eleventy-million dollars on my aquarium last year, its time for controller technology to catch up. Further modularity: Gone should be the days of buying an ORP add-on, PH add-on, conductivity add-on, etc. All of these probes connect to the same BNC socket. We should be able to buy little black boxes and a probe. Hook the black box up to the controller, tell the controller that it is a PH probe, plug in the probe and start monitoring ph. The controller should be able to initialize these "black boxes" as any sort of monitoring tool. I should be able to buy a calcium probe, reconfigure my black box to monitor calcium and switch my ph probe for a calcium probe. Here is a quick crappy diagram of the displays interacting through an api. This same idea should be applicable to the probe/monitor boxes. This is all I have for now, just some ideas that have been banging around. Nothing is set in stone and 100% liable to change. Please reach out if you have any ideas, experiences, etc. to share.